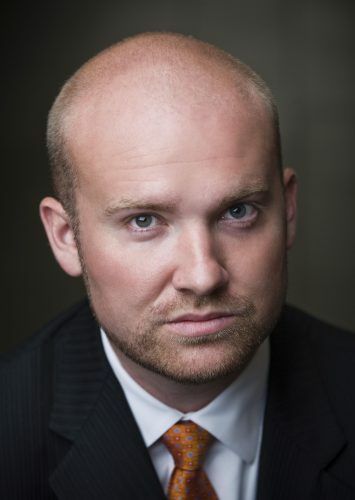 American bass-baritone Tyler Simpson has performed on opera and concert stages around the world. Highlights of the 2016-2017 season include singing the title role in Le nozze di Figaro with North Carolina Opera, Messiah with the Edinburgh Royal Choral Union, and Beethoven’s Christ of the Mount of Olives with the Mormon Tabernacle Choir, having previously joined them for their nationally televised 2015 ‘Christmas Spectacular’ concert as a featured Metropolitan Opera soloist. The 2015- 2016 season marked Tyler’s sixth consecutive season at the Metropolitan Opera, where he has worked on 18 productions after having made his debut in 2010. At the Metropolitan, he has performed roles in Don Carlo, Le Comte Ory, Tosca, The Enchanted Island, and Macbeth. He has also covered roles in Die Zauberflöte, La traviata, Simon Boccanegra, Anna Bolena, Die Frau ohne Schatten, Lulu, and Billy Budd with the company. 2015-2016 also saw Mr. Simpson’s debuts with the Palau de les Artes in Valencia and Hawaii Opera Theatre as Snug in A Midsummer Night’s Dream and at North Carolina Opera as Dr. Bartolo in Il barbiere di Siviglia. Additionally, he returned to Ft. Worth Opera to play Basilio in Il barbiere di Siviglia and to Le Festival Lyrique en Mer as Don Alfonso in Così fan tutte. Upcoming engagements include a return to the Festival Belle-Île-en-mer in Brittany, France for Mozart’s Requiem and other concerts, a debut at the Teatro Massimo di Palermo, Sicily in A Midsummer Night’s Dream, and the title role in Le nozze di Figaro with Pittsburgh Opera. Tyler is a graduate of the University of Kansas (B.M. 2008) and the Yale School of Music (M.M. 2010).